MICHA is a not-for-profit Association committed to connecting Chekhov's legacy with future generations by cultivating an international community of performers, teachers, scholars and directors; researching approaches and providing opportunities to artists interested in a comprehensive teacher training in the Michael Chekhov Acting Technique. We strive to be a support to and global resource for those engaged in practice and research as it relates to Chekhov’s psycho-physical approach and its many forms of application. Board of Directors: Marjolein Baars, Meryl Weinsaft Cooper, Ragnar Freidank, Andrei Malaev-Babel, Michael Mayer, Phelim McDermott, Lenard Petit, Ted Pugh, and Sims Wyeth. Advisory Board: Anne Bogart, Martha Clarke, Pierre du Prey, William Elmhirst, Margo Lion, Floyd Rumohr, Tom Schumacher, Jimmy Smits, Julie Taymor. MICHA incorporated in 1999 and brought together a faculty that included individuals taught at the Michael Chekhov Studio by teachers certified by Michael Chekhov himself – Beatrice Straight, Deirdre Hurst du Prey and Blair Cutting. One of MICHA’s founders, Joanna Merlin, was a member of Michael Chekhov’s Drama Society in California where she studied with him for 5 years. MICHA’s associations and roots date back to the beginnings of Chekhov’s work in America and to Dartington Hall in England. It is therefore fitting that MICHA continue to bring this work to institutions all over the world by training a new generation of performers and teachers to share this remarkable work as it has been passed down from Michael Chekhov himself. Michael Chekhov (1891 – 1955), nephew of the playwright Anton Chekhov, is recognized as one of the greatest actors of the 20th century. At age 20, he auditioned for Constantine Stanislavsky and was invited to join the First Studio of the Moscow Art Theater. Stanislavsky would later refer to Chekhov as his most brilliant student. When the First Studio became the Second Moscow Art Theatre, Stanislavsky invited Chekhov to become its director. At the Moscow Art Theatre, the collaboration between Stanislavsky, Vakhtangov, Meyerhold and Chekhov led to a theater that was bold, expressive and imaginative. In their work they searched for objective principles that would lead to inspired acting. This investigation led Michael Chekhov to develop his psychophysical acting technique, incorporating the imagination and body as well as the intellect. At the height of his acting and directing career, Chekhov was warned to leave Russia. His productions were too experimental for the Soviet regime and were labeled “alien and reactionary”. In 1928 Chekhov left Russia, never to return. He spent seven years in Europe acting and teaching as he moved from Germany, to France, to Latvia and Lithuania. He joined the Moscow Art Players, a company of Russian émigré actors who performed in the United States in 1935. Playing the role of Khlestakov in Gogol’s The Inspector General to critical acclaim at New York City’s Majestic Theater, he was seen by Beatrice Straight who, in 1936, invited Chekhov to establish his Theater Studio at Dartington Hall in England. In 1938, the threat of war with Germany caused the relocation of Chekhov’s Theater Studio to Ridgefield, Connecticut with George Shdanoff as Associate Director. A professional theater company with a permanent acting company was formed called ‘The Chekhov Theatre Players’. They appeared on Broadway and toured to universities and colleges across America. In l942, the Studio was forced to disband because it lost its male members to the draft. Chekhov moved to Hollywood, California where he became an acting coach to the stars, acted in many films, and published his book, To the Actor. He taught a group called The Drama Society. Among the actors who studied with Chekhov in Hollywood were: Ingrid Bergman, Lloyd Bridges, Yul Brynner, Jack Colvin, Gary Cooper, Clint Eastwood, Joanna Merlin, Marilyn Monroe, Patricia Neal, Jack Palance, Gregory Peck, Mala Powers, Anthony Quinn. Michael Chekhov died in Hollywood, California in 1955, before his work became widely known. Twenty-five years after his death, in 1980, Beatrice Straight and Robert Cole opened The Michael Chekhov Studio in New York City. Although the Studio was only open for a decade, it fostered the next generation of teachers of Chekhov’s technique. Chekhov technique emphasizes synergy between the body, imagination, emotions, and intellect. It also treats the actor as an artist, supporting the most valuable, vulnerable area in the actor: his or her creative individuality. The focus is on the actual doing and experiencing "on your feet" right away. 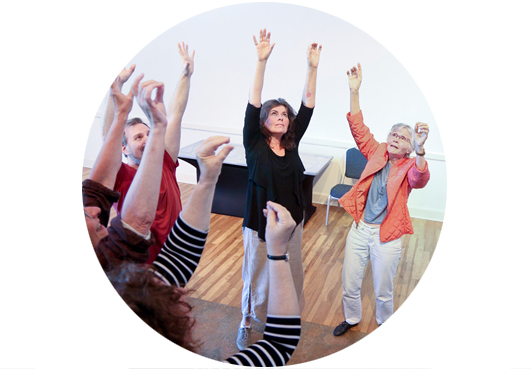 Through different psychophysical exercises, actors quickly start developing a sensation of inspiration and learn to trust their own artistic individuality. All the while, they are also discovering ways to bypass mental acting blocks and preconditioned ideas of themselves, other people, or acting in general. 1. The actor must train his or her body through the use of psychological exercises. The Michael Chekhov Technique seeks a connection between making an outer physical action and sensing how this movement evokes an inner response. All physical exercises are done with the intention of awakening an inner psychological response. This requires training the body to be a fine instrument--well developed, expressive, obedient and sensitive. The body becomes a kind of sponge finely tuned to respond to psychological impulses. Thus the actor strives for a complete balance and harmony between the body and the thoughts, emotions and desires. They are not independent of one another and there is a constant play between the two, one affecting the other. 2. The actor must use intangible means of expression while acting and rehearsing to achieve tangible results. The primary means of expression in the Chekhov method are intangible. The tangible means for the actor--body, speech, voice--are infused with the intangible elements of feelings, imaginations and sensations. An example would be the psychological gesture, which in performance is outwardly invisible but is an inspiration all the while one is rehearsing and performing. This is also true of imaginary body, imaginary center, atmosphere and Stanislavski’s super-objective of the performer and of each character. Michael Chekhov asks that the actor cherish and foster the intangibles as they will act as a guide for the actor through all the exercises of the method and elevate the actor’s process and profession to a higher level. 3. The actor must employ a creative spirit and the higher intellect to unify the various aspects of the performance. Michael Chekhov suggests that within each of us is a hidden laboratory in which sits a wise scientist who embodies our spirit--summarizing, amalgamating, drawing conclusions, unifying all our capacities. Chekhov equates this ability with our so-called higher self, our better self, which has a strong influence in developing our talents. All art is based on the synthesizing power of the spirit. Without this synthesis, one is left with disconnected elements and no sense of archetype or prototype could exist. Likewise, there could be no ensemble, no psychological gesture, no feeling of the whole of our character or of the play. That part of us which is critical divides and separates our creative need to unite. It disguises our true intellect, which is lofty and creative. What we seek is a thinking heart that combines the thoughts from our intellect with the warmth and fire coming from our hearts. 4. The purpose of the Chekhov method is to embody each component of the method as a means of awakening all parts of the method in order to evoke a creative state of mind. It is the actor’s desire to evoke inspiration and a creative state of mind at will. There is a oneness consisting of many component parts to the method. However, all of these parts are connected with one another. As the actor learns to use one correctly, to truly embody one point of the method, other points will awaken by themselves. The deeper one experiences the use of points separately, the greater the possibility that other elements of the technique will appear. An actor is not seeking a method of work that becomes a burden, but a method that will free one’s talents. Chekhov encourages the actor to go over all the various points of the method and ask to what degree and by what means they free his or her talents. This is the primary purpose of the method. The actor then gives his or her attention to how each point of the work answers that question.